A lioness taking a kip in a tree in Queen Elizabeth National Park (Southwestern Uganda). 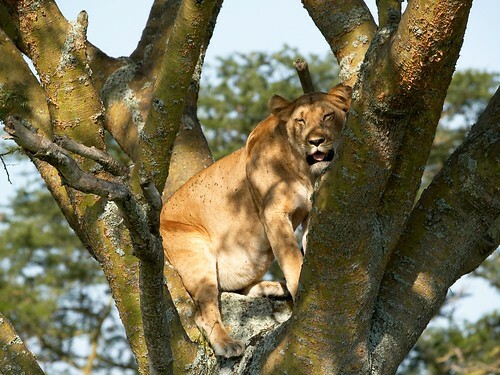 Ishasha lions are famed for tree climbing, a trait only shared with other lions in the Lake Manyara region in Uganda and Southern Tanzania. They often spend the hottest parts of the day in the ficus trees found throughout the area, probably to escape the bites of tsetse flies. It is appears to be a learnt behaviour, and so can therefore be seen as a culture trait of these lions, but it is still unclear why this behavior is rare in other lions groups. Photo by Stefan Gara (Creative Commons, Flickr). Uganda’s New Vision reports here on the problems with the success of mountain gorilla conservation and tourism in the Bwindi National Park. The gorillas are straying from protected areas to forage on farmland.”Instead of feeding our children, we are feeding gorillas” says Carol Asiimwe, an affected farmer. Dr. Arthur Mugisha of the International Gorilla Conservation Programme believes the heart of the problem lies in the overgrowth of trees which are no longer logged. In the past, removing some trees created space for the growth of certain species of vegetation that provide food. Now the gorillas have less to eat since there are more trees and fewer shrubs. The park may try selctive clearing as a solution. Another possibility lies in the use of elephants, as is shown in another park in Uganda, where elephants regularly knock down trees allowing shrubs to grow, thereby give the gorillas more to eat. This is a reminder that thick forest is not always more diverse and biologically diverse than thinned out forest. Bwindi Impenetrable National Park is located in southwestern Uganda. Bwindi Impenetrable Forest represents one of the oldest (50 million years), most complex and biologically rich systems on earth. In addition to its biodiversity value, Bwindi also has a significant regulatory function on local climate and acts as an important water catchment area. Previously designated as a forest reserve, with relatively liberal (and rarely enforced) regulations regarding access rights, it was accorded higher protection status in 1991 as a national park, in recognition of its high levels of biodiversity and the perceived threats to its long-term integrity. The new national park was renamed Bwindi Impenetrable National Park (BINP). This had the immediate effect of closing all access to the forest for adjacent communities, resulting in huge amounts of conflict and resentment.